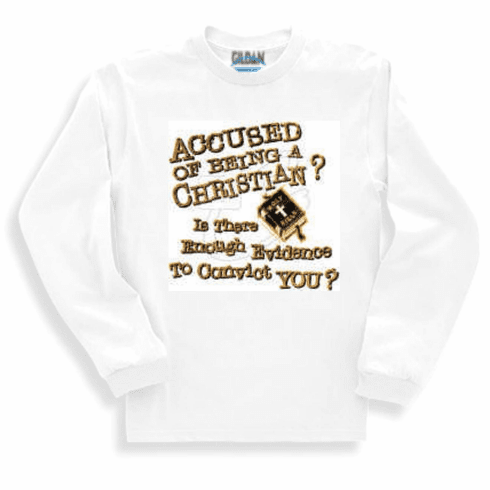 Christian long sleeve t-shirt or sweat-shirt Accused of being a Christian? Is there anough evidence to convict you? Home/Our HoneVille.com Store/Christian Designs /Christian Designs page 2 /Christian Designs Page 3 /Christian Designs page 4 /Christian Shirt Accused of being a Christian? Is there anough evidence to convict you? /Christian long sleeve t-shirt or sweat-shirt Accused of being a Christian? Is there anough evidence to convict you? Home/Our HoneVille.com Store/Christian Designs /Christian Designs Page 3 /Christian Designs page 4 /Christian Shirt Accused of being a Christian? Is there anough evidence to convict you? /Christian long sleeve t-shirt or sweat-shirt Accused of being a Christian? Is there anough evidence to convict you? Home/Our HoneVille.com Store/Christian Designs /Christian Designs page 4 /Christian Shirt Accused of being a Christian? Is there anough evidence to convict you? /Christian long sleeve t-shirt or sweat-shirt Accused of being a Christian? Is there anough evidence to convict you?